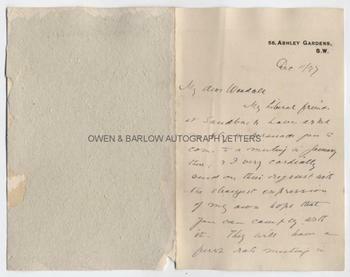 WALTER McLAREN Autograph Letter Signed. ALS. 3pp. 56 Ashley Gardens, S.W. December 11th 1897. To [William] Woodall. Together with a fine contemporary portrait photograph. "My Liberal friends at Sandbach have asked me to try and persuade you to come to a meeting in January there, and I very cordially send on this request with the strongest expression of my own hope that you can comply with it. They will have a first rate meeting in their town hall, holding 600 or 700; and as Sandbach is the home of Mr Marriott, the Tory candidate, the Liberals there are most keenly alive to the necessity of fighting. They suggest early in the month, but any day probably would suit them. A Thursday is perhaps the best day of the week, barring the last Thursday of the month. You will very greatly oblige me if you can come and I only wish I could repay your many kindnesses". 8vo. Approx 7 x 4.5 inches. Laid down on remains of an old album leaf with some minor damage to the last leaf, else very good. 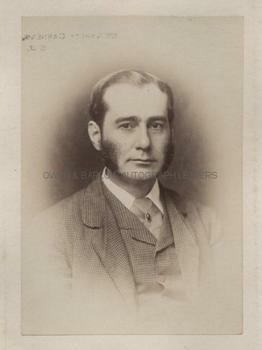 The portrait of Walter McLaren is a contemporary gelatin silver print photograph, measuring approx 5.75 x 4 inches (excluding mount). It shows Walter McLaren head and shoulders in vignette and is laid down on card leaf from an album page with mounting damage to verso but the photograph is in fine condition. Walter McLaren was the Liberal M.P. for Crewe for 11 years between 1886 and 1912. His mother was the daughter of the radical politician John Bright. 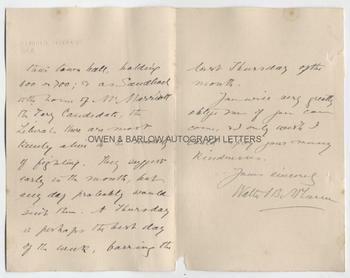 Mr Marriott is probably William Thackeray Marriott, who had been first elected as Liberal M.P. for Brighton but who had famously fallen out with Joseph Chamberlain and W.E. Gladstone and had defected to the Tory Party. 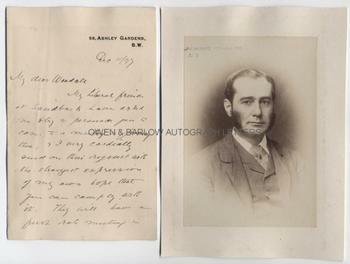 In 1885 Marriott had been appointed Judge Advocate General by Lord Salisbury and in 1892 became Chancellor of the Primrose League, in which post he was one of the prime organisers against Gladstone's Irish Home Rule Bill. From a 19th century collection made by the radical Liberal M.P., William Woodall.